This is a healthy, yet rich tasting soup that takes minutes to cook and has only a couple of ingredients. We often crave something hot and filling during these cold nights, so this soup hits the spot. 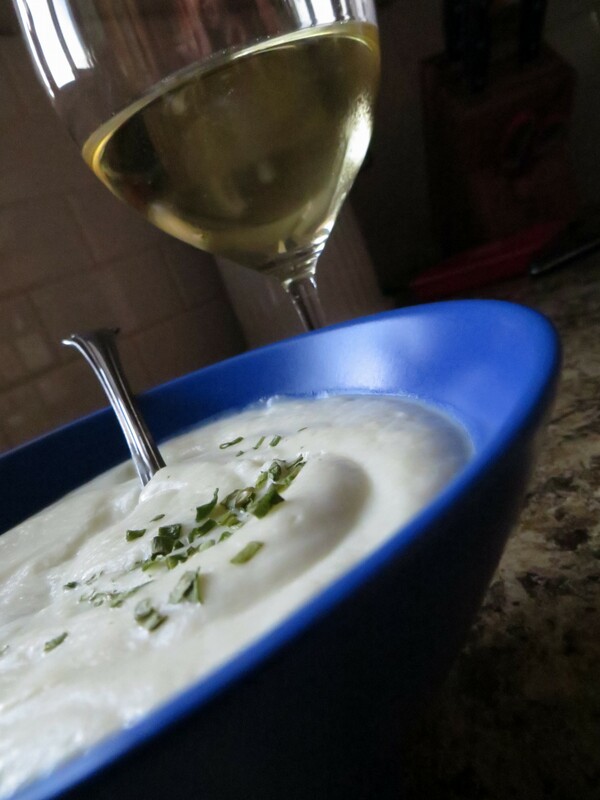 Cauliflower is a powerful vegetable known for its vitamin C and K. I added fennel to the soup for a twist that gives a hint of licorice flavor. To ensure any soup maintains a flawless white color, use white pepper. This will make two bowls of soup, because we always want seconds when it’s this good. You’ll be shocked there’s no butter or cream in this decadent dinner when you taste it. Enjoy it with a glass of Sauvignon Blanc. VitaMix and add 1/4 cup milk. Blend on variable speed for 15 seconds and then on high for 15 seconds. 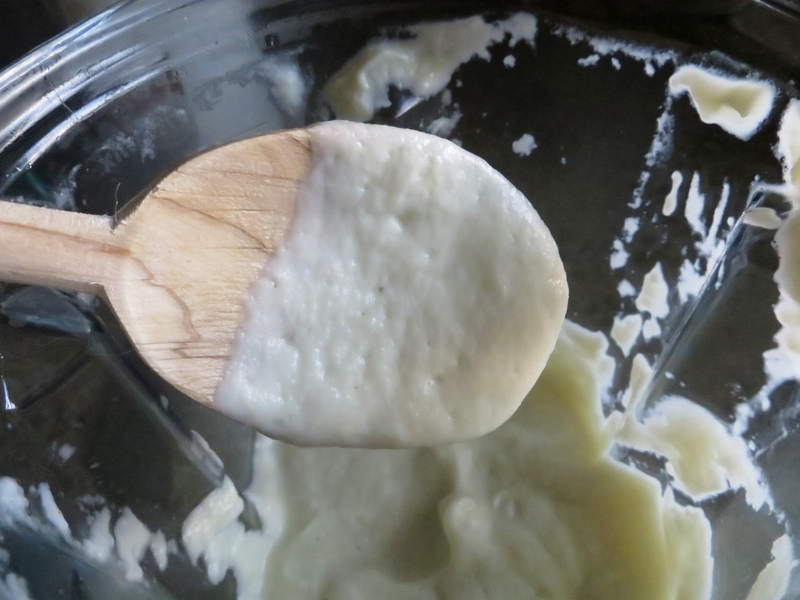 If using a blender, mix ingredients until thick and whipped. Serve in a bowl and sprinkle chives on top. For vegetarian soup substitute water for the chick broth. 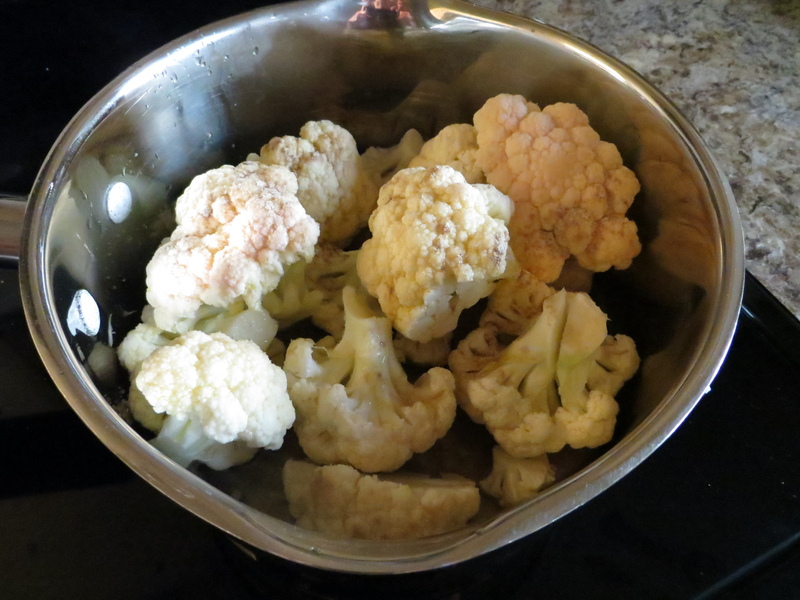 Posted in Recipes and tagged cauliflower, dinner, recipe, soup, vegetables. Bookmark the permalink. I have something embarrassing to admit. 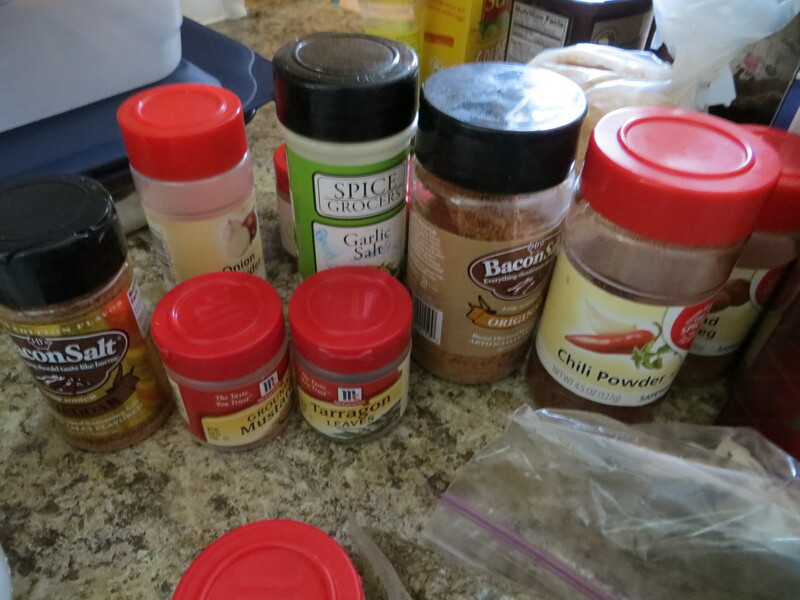 Although I think I’m not alone in this cooking faux pas, I must confess I have old spices in my cupboards. Now you might think they are a couple of months expired, but I’m ashamed to admit some of them are several years old. 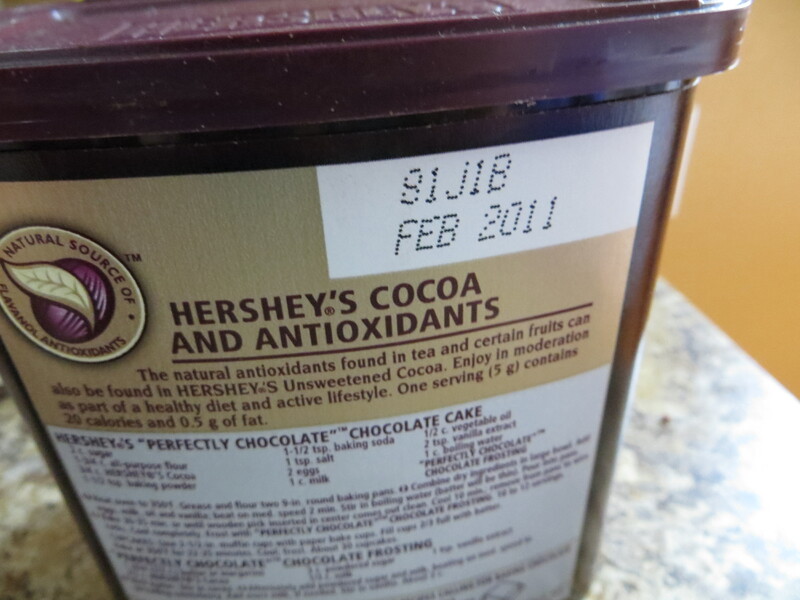 My baking cocoa was four years old – yikes. I found another half dozen items that had to go. Some dried and whole spices have a short shelf life while others can last up to three years. Although you won’t get ill by eating expired spices and herbs, they will lose their flavor profile, aroma and intensity. Now it’s time to for us all to purge those expired spices and replenish our seasonings and spices. As a single person, I often don’t finish spices in large containers before their expiration dates. I’m sold on the bulk section of grocery stores to buy smaller and fresher quantities. For spices you rarely use or need for a specific recipe, turn to the bulk section. You will save money when you buy two or three tablespoons of a spice like caraway seed, cardamom and turmeric in the bulk section, compared to a large container of it. But be careful, when I was at my local QFC store, I found almost all of the bulk spices had already expired in their large tubs. That means that they’ve been sitting on the shelf for a long time. Write the purchase date on your bags and jars of spices. This will help you track how old they are. Store spices in a cool, dark area of your kitchen. Rub a spice between your fingers and taste it. Time to toss it in the compost not the saucepan, if it lacks an intense flavor kick. Posted in Food news, Recipes and tagged grocery store, herbs, seasonings, spices. Bookmark the permalink. Most of us have foods we hate or food phobias. My friend Shannon can’t stand olives, and Patty believes beets taste like dirt. Mine has not been a hate of fowl, just a fear of it – fear of getting sick by eating undercooked poultry. What are your food fears? Let’s step back about 35 years to me as a child. My family had the philosophy of we eat what we cook, no arguments. I would whine, fight and hide my shriveled peas and the over-cooked, fatty, cheap steak that tasted like rawhide. Summer in Iowa meant juicy tomatoes, corn on the cob and grilled lemon chicken. When served a chicken breast and a leg, I took a big bite and discovered veins, tendons, bones and very pink meat. I complained to my parents that the chicken was raw and that I would get sick. My parents had no compassion, saying I had to finish eating the chicken, including all the meat near the bones. I don’t recall if I ever got sick, but since then I’ve had a fear of plunging my teeth into a piece of fowl. In fact for years I couldn’t eat any meat on a bone, fearing the meat was raw and I would get sick. No BBQ ribs and no chicken wings. Boyfriends would cut the meat off the bone for me, and other times I would order boneless poultry. I was unable to cook a full-size chicken, let alone pick it up with my bare hands and take a bite. 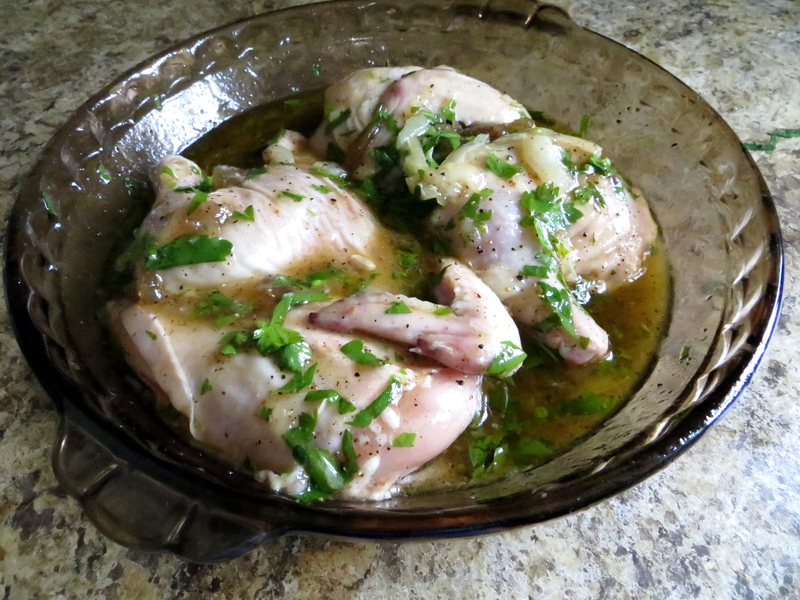 Now it’s time to break my food phobia by getting to know the bird on a raw level and making my own recipe. 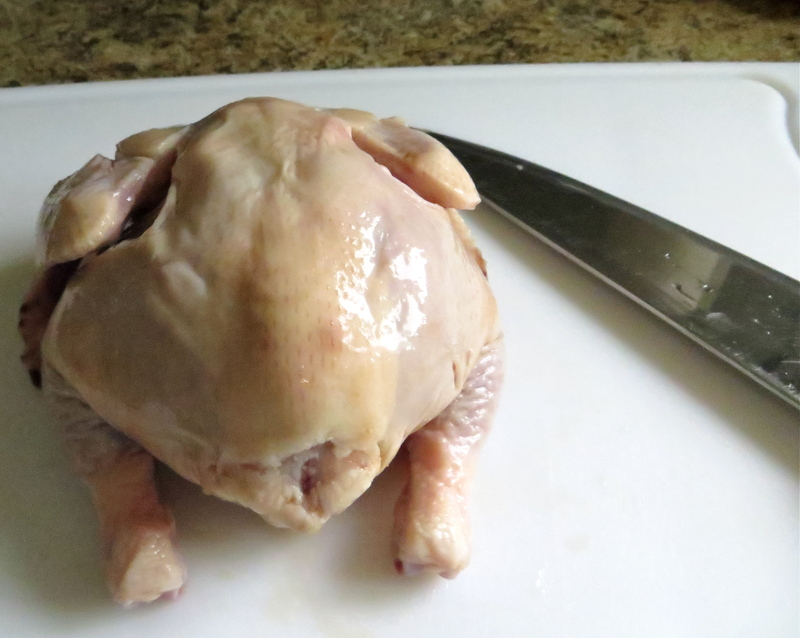 I bought a Cornish game hen, a small bony fowl that’s a perfect dinner for one or two people. I cut it in half, right down the breastbone, flattening it a bit with my hands, hearing the bones crunch. I marinated the two halves in a combination of fig and lemon preserves, parsley, cloves and other spices. I can finally say I broke my fear of cooking small fowl and eating it. But you still won’t catch me gnawing on chicken wings. I hope this helps you take risks with food. 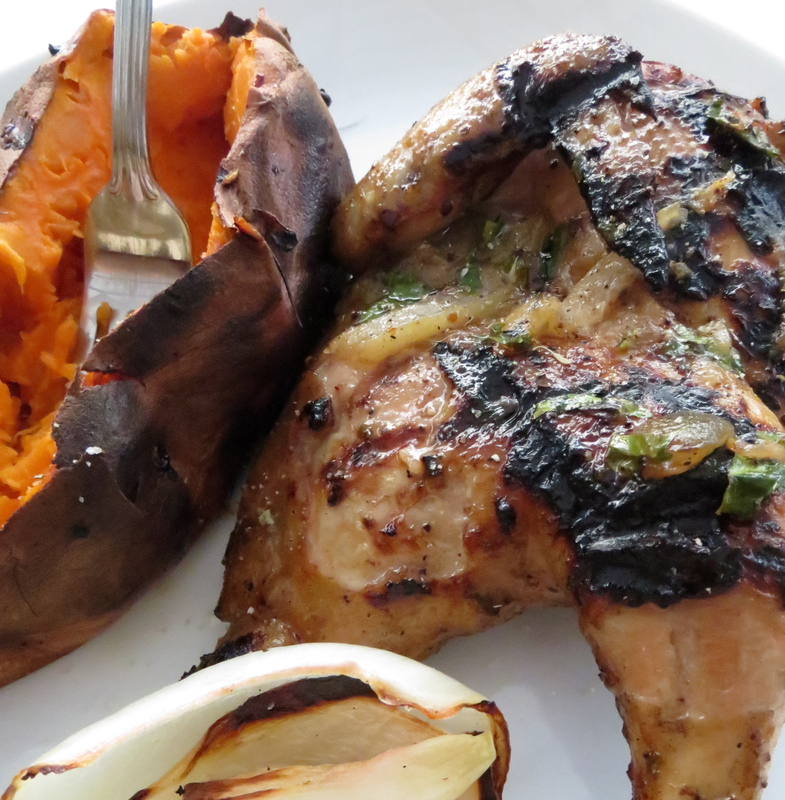 For side vegetables, add a sweet potato and half onion to the grill. Cut the hen in half, rinse with water, pat dry and flatten with hand. Mix all the remaining ingredients together and then marinate the two halves for at least two hours. On a two-burner grill, heat to medium or 400 degrees and set the other burner on low. If using a charcoal grill, put coals on one side of the grill to create the same effect. 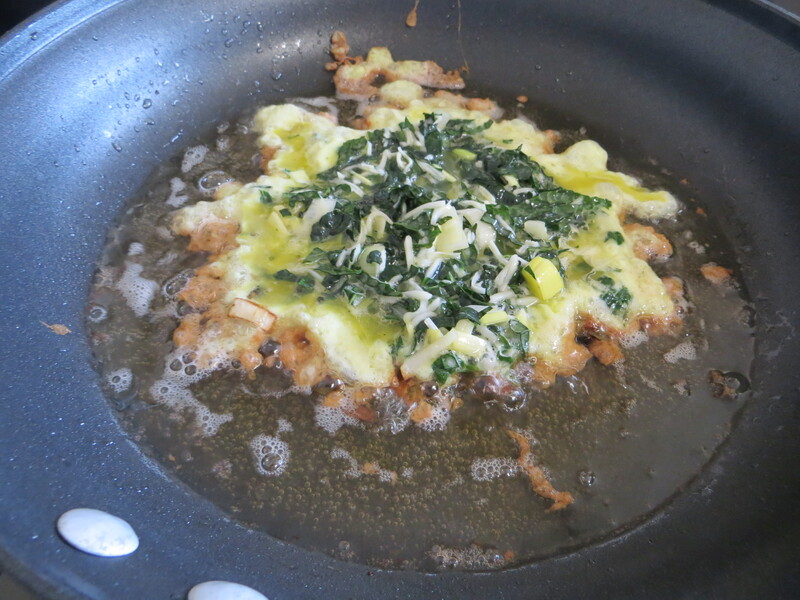 Coat the grate with olive oil. 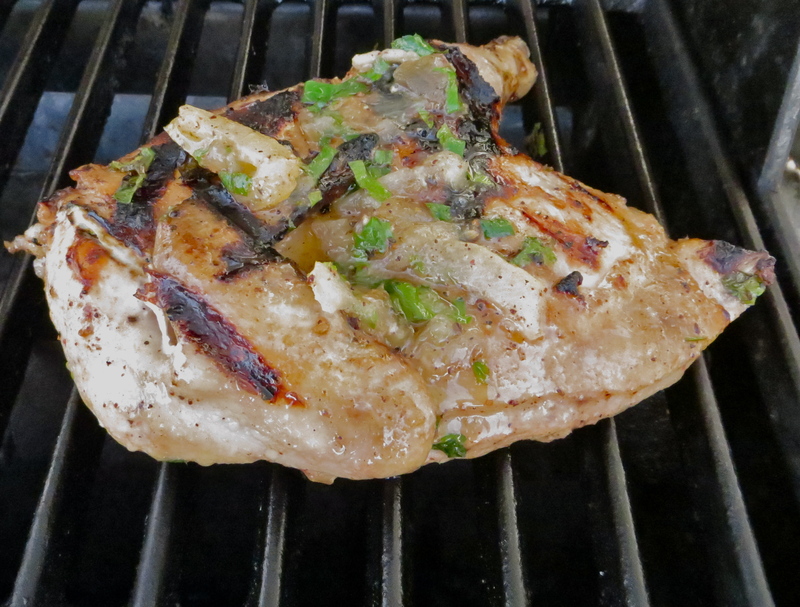 Cook skin side down for 6 minutes on medium, then move it to the low temperature area of grill for 8 minutes. Flip the two pieces and cook on medium for 6 minutes and then 8 minutes on low. Total cooking time should be about 28 minutes. The internal temperature on the thigh should be 165 degrees and juices should be clear. Let the hen rest for several minutes before taking a bite. Posted in Food news, Recipes and tagged bourbon, cornish game hen, fowl, grill, lemon, poultry, recipe. Bookmark the permalink. Use a cinnamon stick as a stir. Ingredients include bourbon and Lagrima vanilla. With more cold and rainy nights ahead, I thought what better way to warm the heart and soul than with a hot toddy. As a child I recall when my mom would serve me warm milk before bedtime. The warm milk relaxed my body, and my eyes became heavy. So I’ve created the adult version of this drink with some spices and a little kick. Try my warm cocktail that tastes just as comforting as when you were a young child. 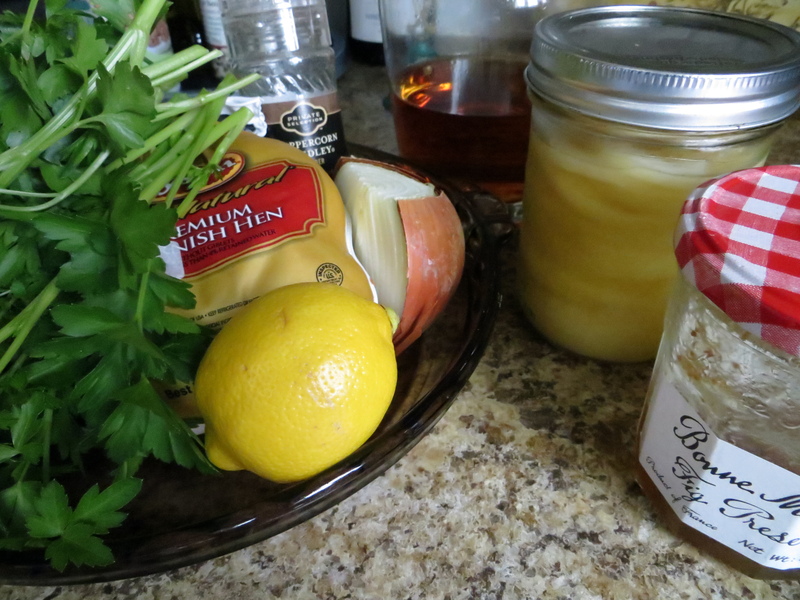 This is the perfect hot toddy after a day of skiing or outdoor hiking. I concocted this recipe using a sample of Lagrima vanilla, made in Seattle by Neil and Rebekah Beam. They get single-source organic vanilla beans from places like Uganda and use vodka, bourbon and rum for their extracts. Combine all ingredients in a small saucepan and cook over medium-low heat for five minutes, occasionally stirring it. 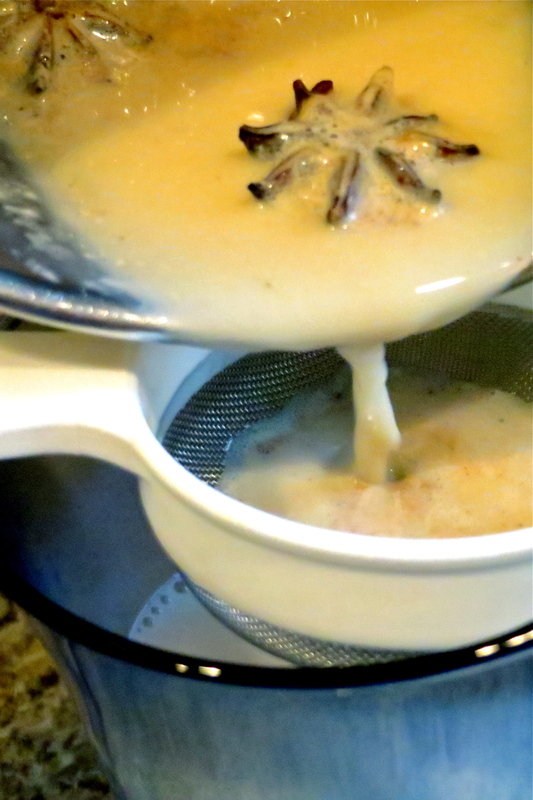 Remove from heat, and pour mixture through a small, fine mesh sieve or colander and serve in a brandy glass or coffee mug with a cinnamon stick. Posted in Recipes and tagged bourbon, cocktail, drink, milk, vanilla. Bookmark the permalink. Of course the Superbowl is about football, but let’s not forget the party food. Whether you are attending another person’s party or crashing on the couch to watch the game Sunday, you must make my addicting Rose Candied Peanuts. With just four ingredients this is an easy, aromatic snack to make that can be nibbled on while the Seahawks beat the Broncos or added to your lunch bag. This healthy, sweet combination takes only a couple of minutes to make and is easy to transport to a party. Sprinkling rose water on the peanuts gives them a sweet, floral aroma unlike anything you’ve smelled before. A bottle of rose water can be purchased at most Asian food stores and other gourmet markets for $5-10. I used roasted peanuts, but try almonds too. The candied peanuts can be stored for about one week if they stay out of your hands that long. 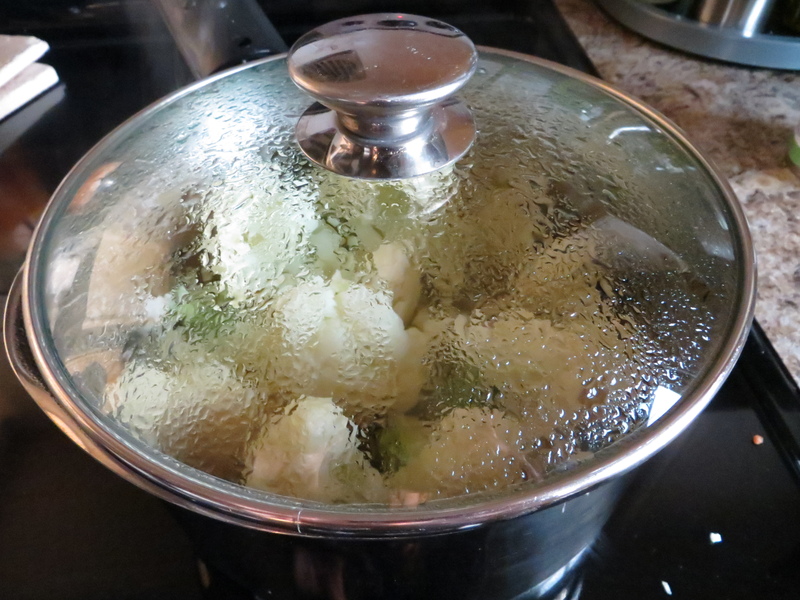 Dissolve sugar in water and bring to boil in small saucepan. Combine the water, sugar and peanuts in a saute or frying pan. Cook on medium high heat, stirring often until the syrup evaporates. Sprinkle rose water on nuts, stir and let cool. Posted in Recipes, Video and tagged appetizer, peanuts, recipe, snack. Bookmark the permalink. 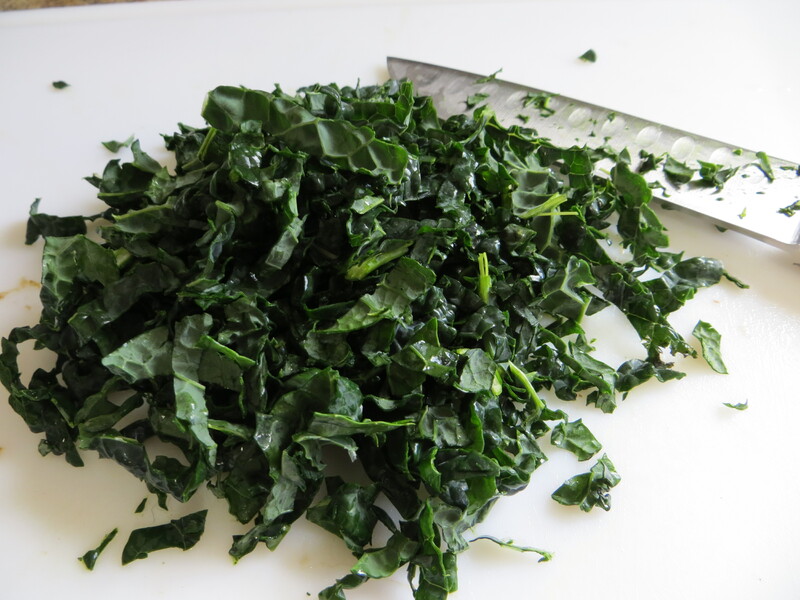 Kale is the IN food when it comes to cooking. So I created two recipes to urge you to buy a bunch of kale and try the bold, deep, green vegetable that most people set aside because it’s used mostly as a garnish. 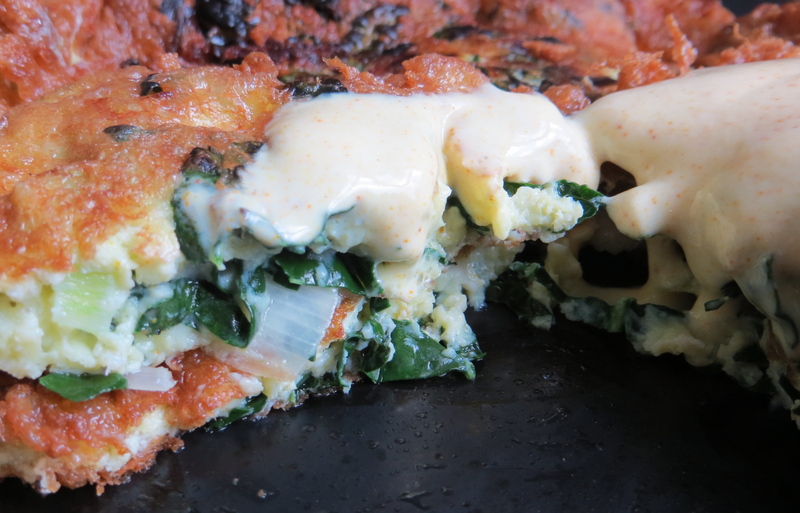 This recipe combines kale and leeks to create a pancake for brunch, lunch or dinner. 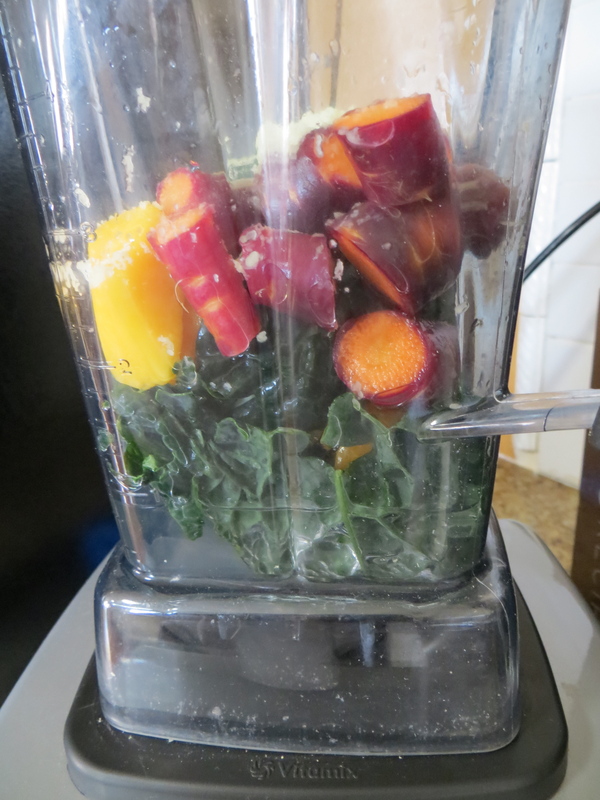 Another way to use the rest of your kale bunch is to make a breakfast kale smoothie that is full of Vitamin A, C and K. If you are adventuresome in the dirt, plant kale in your garden. 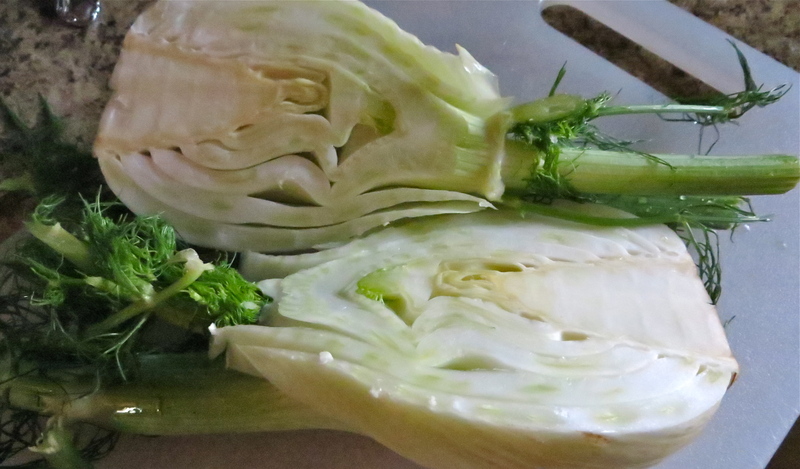 It can grow in the Pacific Northwest during the fall and winter months and is also available at grocery stores. I used the kale and leeks from Oxbow Organic Farm, a 25-acre vegetable garden near Carnation that sells its produce at farmers markets, restaurants and to weekly subscribers. 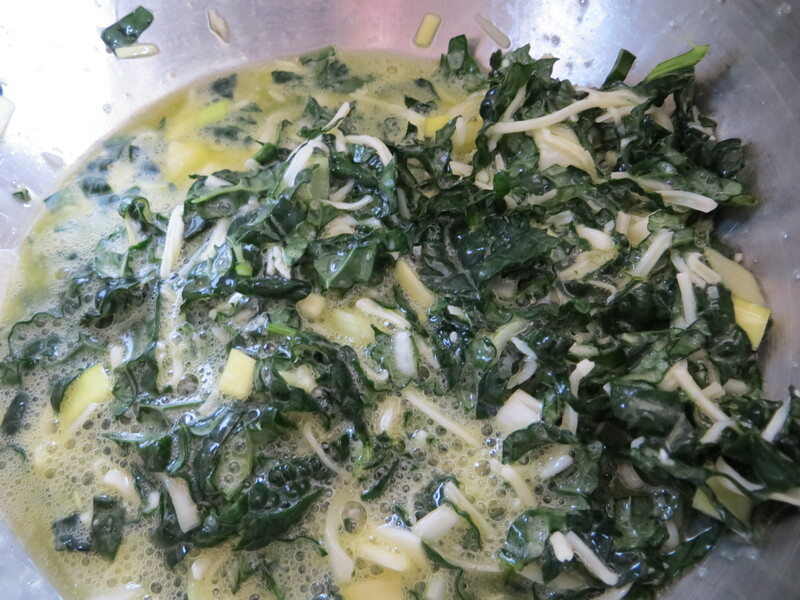 Mix kale, leeks, eggs, water, salt, pepper and cheese together in bowl. In a frying pan, heat peanut oil on medium high until pan is hot. Use a half cup measuring tool to gently drop the mixture into the oil. Cook for two minutes on medium high until brown, using a splatter guard if grease starts to jump. Flip and cook another two minutes. Place on paper towel and drop the rest of the batter into the pan and repeat. 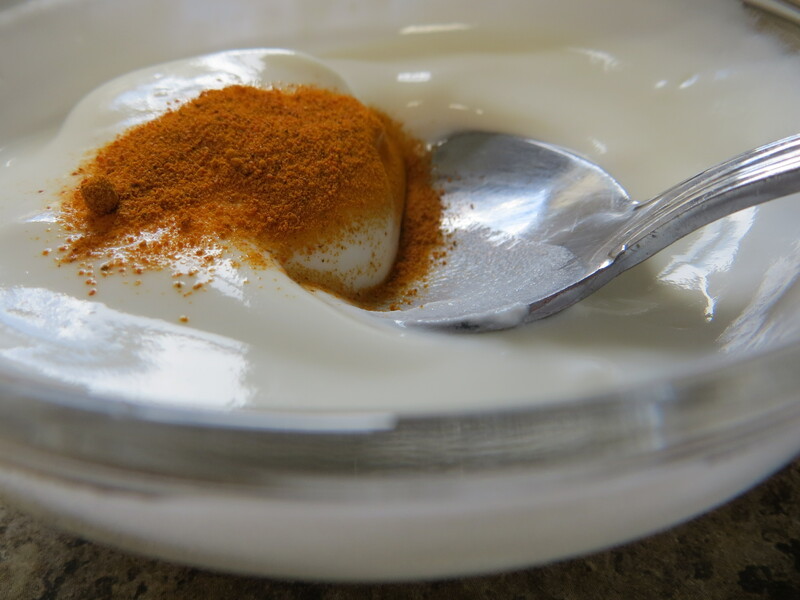 Mix sour cream, yogurt, turmeric and dash of salt together and add dollop to the top of the pancakes. 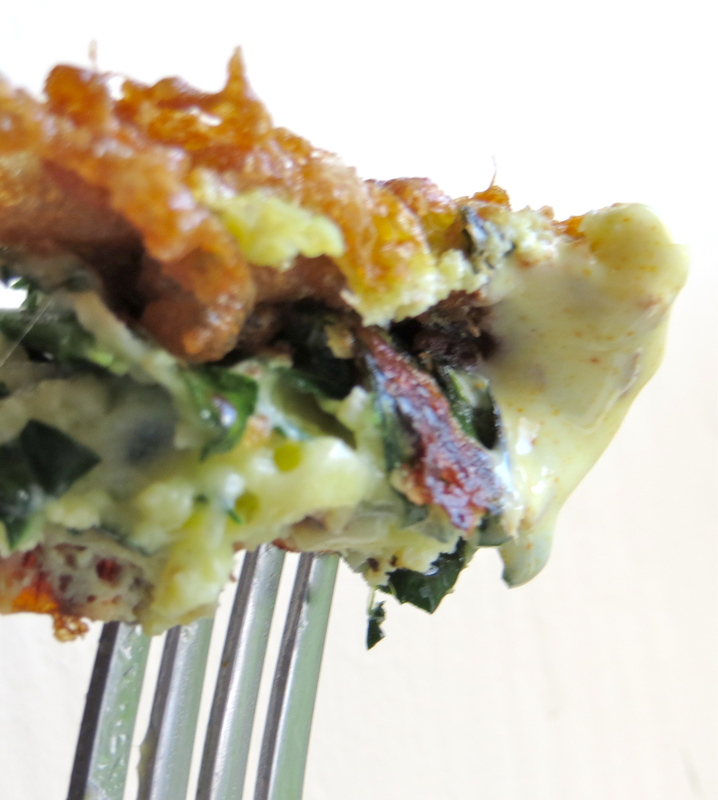 Posted in Recipes and tagged egg, gluten-free, kale, leeks, recipe, vegetarian. Bookmark the permalink. Get a pep in your step with this healthy, fruit and vegetable morning smoothie. After purchasing a VitaMix (a powerful blender), I’ve been creating my own combinations of fresh ingredients to make a great smoothie that’s flavorful and nutritious. 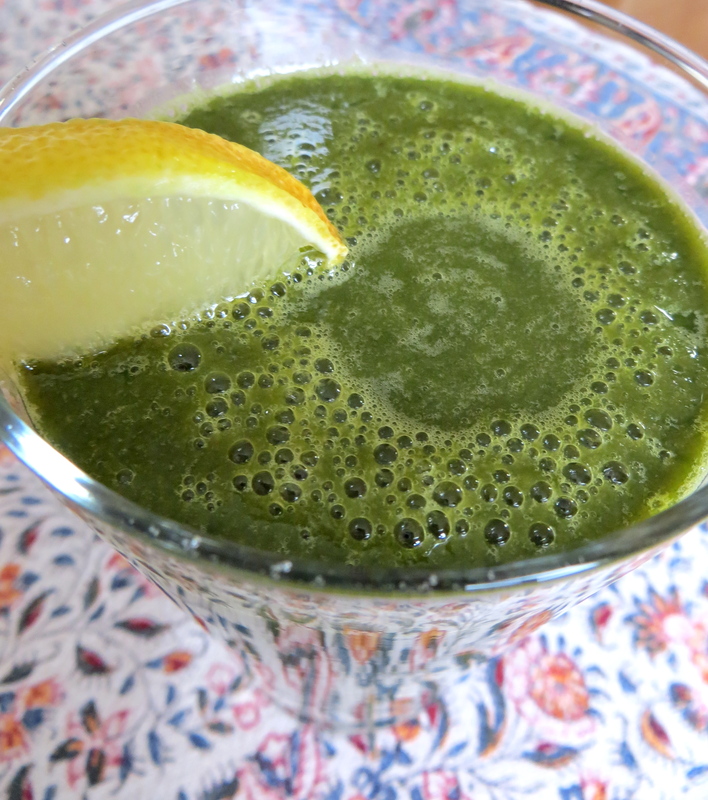 The key to this smoothie is raw kale, because it has so much vitamin A, C and K. It also is considered one of those vegetables that feeds the brain and is anti-flammatory, helping heal a sore and stiff body. Kale is a popular trend for those on the health kick, but Dr. Drew Ramsey writes you should make it part of your staple diet. This is one of the quickest recipes you can make in the morning and even drink it on the way to work. Next week I’ll show you another recipe with kale, so that the bunch you buy at the market doesn’t go to waste. 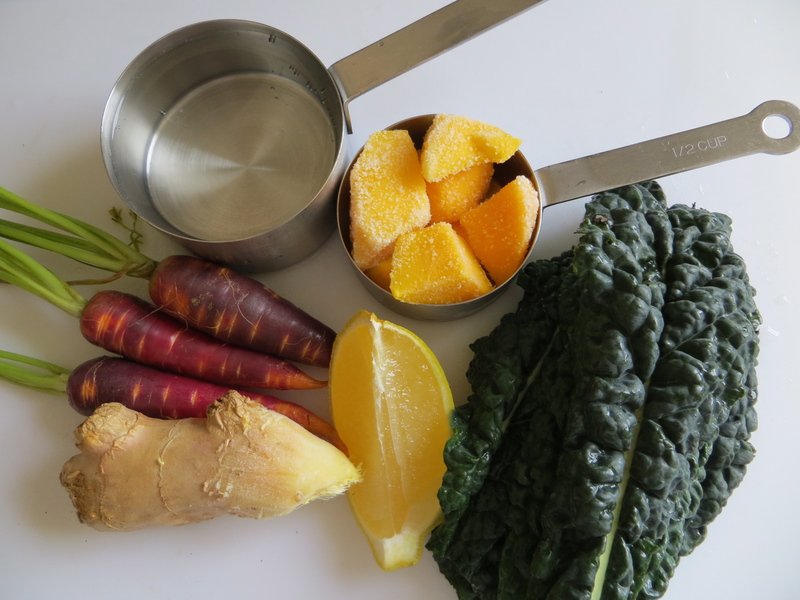 Cut vegetables into large chunks and add all ingredients to VitaMix or your blender. Pulse on low for 10 seconds and then turn on high for another 20 seconds. Serve immediately. Posted in Food news, Recipes and tagged breakfast, carrot, drink, kale, mango, smoothie, VitaMix. Bookmark the permalink.